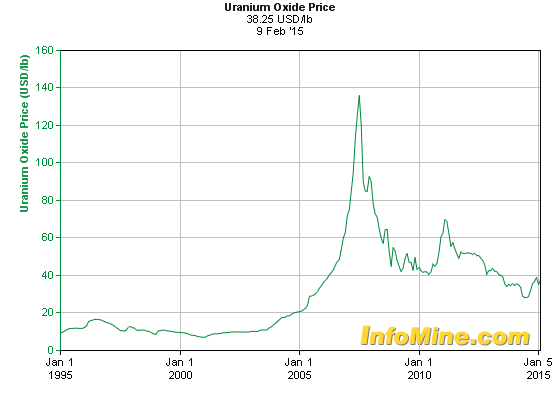 Uranium prices have been on a downward slide for half a decade now. Trading around $40 per pound, uranium simply can't stay this low for much longer. Over the coming months and years, uranium prices will creep higher — and uranium companies sitting on currently undervalued deposits will offer investors tremendous upside. The last uranium boom kicked off in 2005 as part of the "commodity supercycle." Its upward ascent ultimately peaked in June 2007 at around $140 pound. Oil would touch $145 a year later. A new uranium mine called Cigar Lake was supposed to come online in 2007. It is the largest undeveloped high-grade uranium mine in the world. However, Cigar Lake didn't come online. Instead, it experienced a major flood. With the world expecting this new source of uranium supply, prices started spiking quickly — all the way up to $138 per pound — before the popping of the housing bubble and the financial crash brought them back down. The incident at Fukushima helped keep them low. Uranium demand is starting to creep back up. And with Cigar Lake still in a perpetual state of limbo, the world is starting to scramble for new supply. The stage is set for a new uranium boom. At the very basic level, there simply isn't enough supply to meet demand. The world's reactors needed 65,000 tonnes of uranium in 2013; but the world's mines only produced around 58,000 tonnes. Some of the difference is made up with reprocessed fuel, but a supply crunch still looms for a litany of reasons. Nuclear is the cleanest (no emissions) and safest (per kWh generated) than any other fuel source. It will be the go-to source for the world to provide clean baseload energy. Even Japan is not shying away, with Prime Minister Abe calling those who want to end nuclear power in Japan "irresponsible." For output to increase to meet rising future demand, uranium prices have to rise. 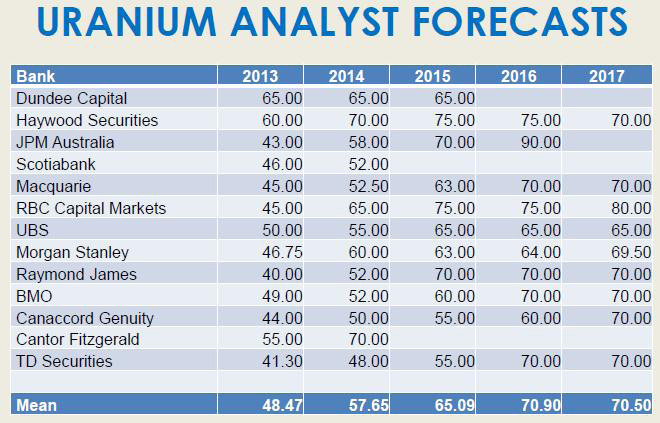 That's why analyst forecasts for uranium prices in 2016 and 2017 are about 30% higher than they are today. With uranium prices slated to rise in the years ahead, what's the best way to play it? Because uranium stocks typically rise 2x-4x the rate of the underlying uranium price, my money is on uranium stocks. 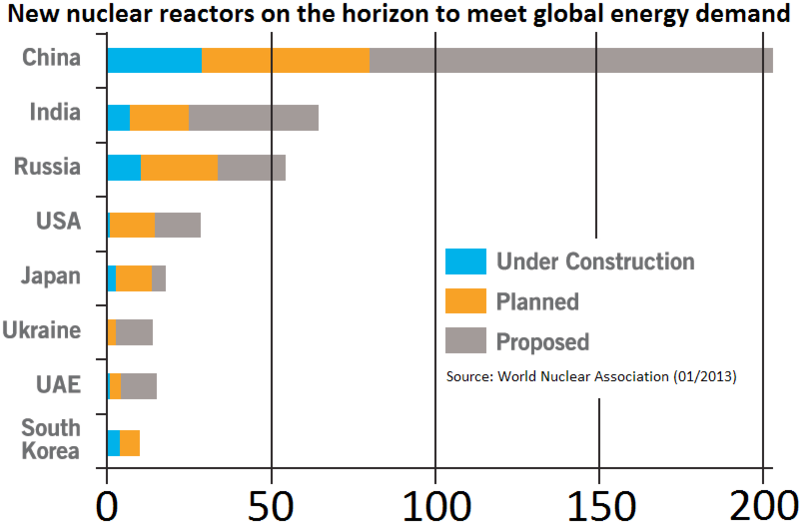 Increasingly, one region is being looked to as a large supplier of future uranium. Currently, the Athabasca Basin provides 16% of global uranium production. This is second only to Kazakhstan. 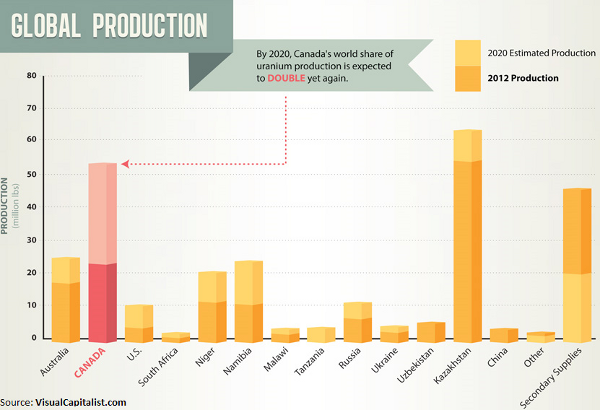 Over the next few years, though, Athabasca will be the fastest-growing area for uranium production in the word. Its output is expected to double by 2020. 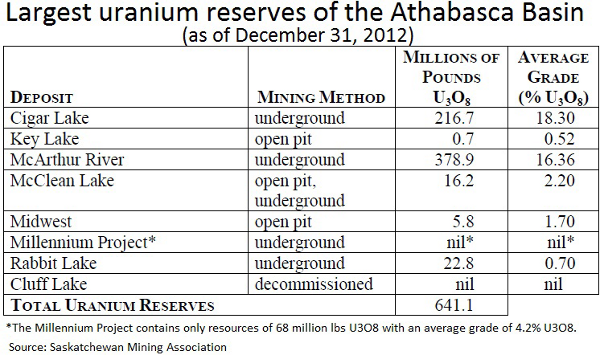 For these reasons, Athabasca is about to become the world's uranium hotspot. A bidding war between Cameco and Rio Tinto (NYSE: RIO) for Hathor's Roughrider deposit ended at $642 million in early 2012. Denison paid $71 million to Fission Energy for a portfolio of projects in the area earlier this year. It's also made a $26 million offer to take out Rockgate Capital (TSX: RGT). Areva owns 37% of Cigar Lake, 30% of McArthur River, and the majority of the Midwest Mine. This uranium grab is only getting started. The western and northern portions of the basin are only now being explored, and they look very impressive. The tiny exploration companies that own them will grow by giant multiples as uranium price start their climb toward $70 per pound. I have my eye on two of them specifically — and I went to visit them a few weeks ago, more than 2,500 miles from Baltimore. So you can get ahead of the crowd on this one if you check out my premium publication, Nick Hodge's Early Advantage. In it, I've put together a video detailing all the reasons for the coming uranium rush, my tour of the western Athabasca Basin, and two companies in particular are poised for the highest gains.